Keith Almstedt, guitarist, is a former Lone Star College - Kingwood music student, and is now Adjunct Professor of Music there. He holds two Bachelor of Arts degrees in Guitar Performance and English from the University of New Orleans, where he studied with John Rankin. In 2006 he completed a Master of Music degree in guitar performance from the University of Akron, where he was also a graduate teaching assistant under the tutelage of Stephen Aron. Keith has performed in masterclasses for prominent guitarists including Sergio and Odair Assad, Dr. Eliot Frank, Stephen Robinson, and Andrew Zohn. His responsibilities at Lone Star College - Kingwood include teaching guitar, Music Fundamentals, and Music Appreciation. 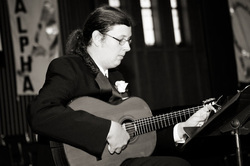 He has taught at Kingwood Music School since 2008, and has over two decades of experience as a guitar instructor.